Tamaraw Falls Puerto Galera cool refreshing water, just perfect for a quick dip. Tamaraw Falls Puerto Galera is another interesting place to visit and cool off, especially if you have had enough of the, sun, beach and water. I know, I know how can you possibly get to much of the crystal clear water and delightful beaches of Puerto Galera, but just in case you would like a break why not take a trip up to the Tamaraw Falls. The Tamaraw Falls are easy to get to. From Puerto Galera take the road that goes through San Teodoro and onto Calapan, jeepneys ply the road regularly, as they do throughout the Philippines. 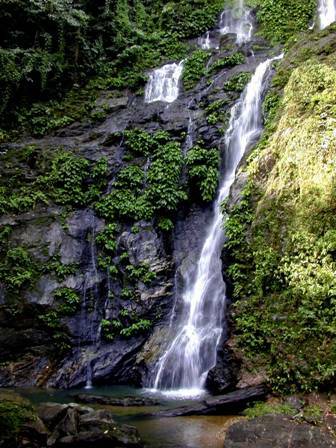 You will find the Tamaraw Falls before San Teodoro. The distance is only about 15 kilometers from Puerto Galera and you would have to be blind to miss it as the Tamaraw Falls Puerto Galera is literally a couple of meters off the road. There are a series of small waterfalls that end in the final drop into the cool water of the pool at the bottom of the Tamaraw Falls. The water at first is quite cool, but extremely refreshing once you get over the initial sudden shock, it is not that the water is so cold, but rather the air temperature is so high that makes such a contrasting difference. There is a picnic area and a larger rock pool for swimming, a small fee is charged to enter the picnic area. The larger rock pool is man made and does look like it has seen better days, it is a little bit tired. It is a nice alternative to the energy of Sabang Beach and the beaches around Big La Laguna Beach. go and have a look and decide for yourself.